The barrel stitch, commonly referred to as the circle stitch, produces a cylindrical shaped lanyard. Most often made with plastic craft lace, creating lanyards is a favorite activity in kids' camps. This craft is sure to entertain children for hours as they create and design their own lanyards, bracelets and keychains. Follow these simple instructions on how to make barrel stitched lanyards. For the first stitch, find the center of the first piece of gimp and wrap it twice around your index finger at that point. Take the second piece of gimp and route it under both loops, pulling it through until it is centered. You now have a left and right strand, as well as a left and right loop. Take the right strand, go over the right loop and under the left loop. Take the left strand, go over the left loop and under the right loop. Do not cross the strands, keep the right strand closest to your body and the left strand toward the outside of your finger. Very carefully slide the gimp off your index finger and pull all four strands, this will create the starting stitch. After the starting stitch, you will have a left, right, top and bottom strand. Take the left strand and cross it over and up in-between the top and right strands. Take the right strand and cross it over and down between the bottom and left strands. This creates two loops. 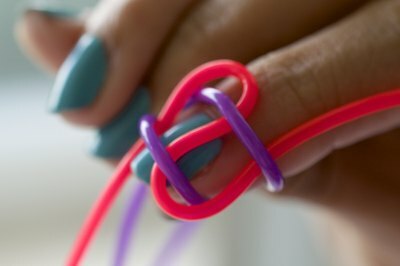 Take the bottom strand and hop over the first loop (down and left) and under the second (up and right). Now take the top strand and again go over the first loop (up and right) and under the second (down and left), though they will be reversed. Pull all four strands tight. Repeat this until you are satisfied with the length of your lanyard. To finish and tie off the lanyard, repeat Step 2 one more time creating another stitch, but this time don't immediately tighten the stitch. 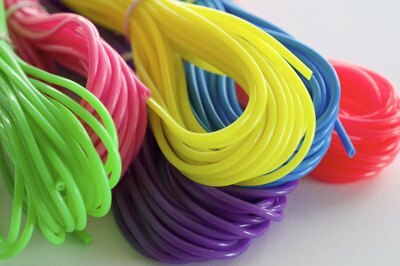 Start with one strand, it doesn't matter which, loop it under to the right through a loop of the same colored strand up and out through the middle and top. Repeat this for the three remaining strands and then tighten them all together. Tighten each individually and the lanyard should be properly tied off. 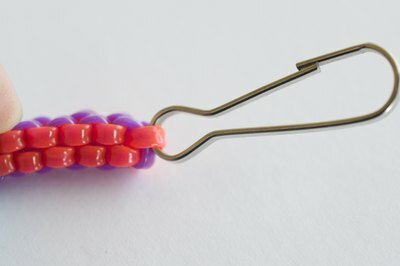 Cut off the remaining gimp or optionally tie it to a keychain or carabiner. One foot of gimp is roughly equivalent to 1.5 inches of stitched lanyard, keep this in mind when starting your barrel stitched lanyard. Be sure to pull each stitch extremely tight so that the lanyard doesn't easily unravel or look loose and sloppy. Getting the hang of holding the lanyard and holding the strands in place while stitching will take some practice, so don't allow yourself to get frustrated.